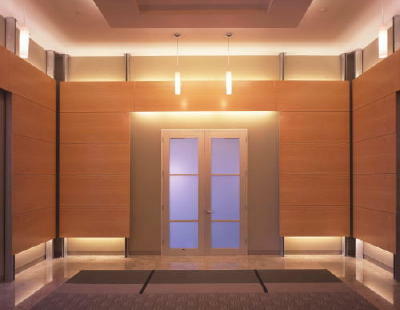 This is a commercial project we provided a considerable number of balanced and sequenced plain sliced Maple wall and facade panels. In some instances the panels were attached to a track system which created a void that allowed lighting to be installed behind the panels at both the top and bottom. 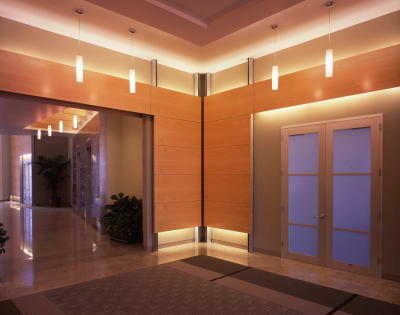 This feature created up and down lighting that is very attractive. 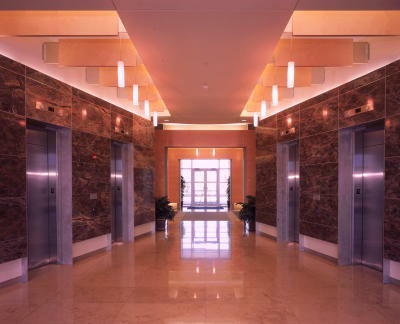 Horizontal panel installations have been popular in commercial projects for quite some time. It seems to have caught up to residental because we are being asked for horizontal matching more and more all the time. What we do not see is the same type of light schemes. This is just one of many commercial panel projects we have supplied panels for. Most of the time when we furnish residential panels they will be cut to size but in need of finish optimization and edge banding, unless they have a thicker edge. Commercial panels more often than not will be cut to finish size and edge-banded. We typically send panels out sanded to 150 gritt figuring that most shops are gooing to do some finish sanding once they get to work with them.